Live Life the All Star way…. 1. Magnetic Lasso: The magnetic lasso tool was my best friend for this project. I had to keep the shoes from the background, or the background from the shoes and I did that using the magnetic lasso. It is a brilliant tool because it sticks to the side of the line I was traveling by so it wasn’t as hard to maneuver as the regular lasso tool. 2. Eye Drop: I used this tool a lot too because I wanted to keep the colors consistent through out the ad. By using the eye drop tool I was able to make the font color the same as the colors of my shoes and socks. 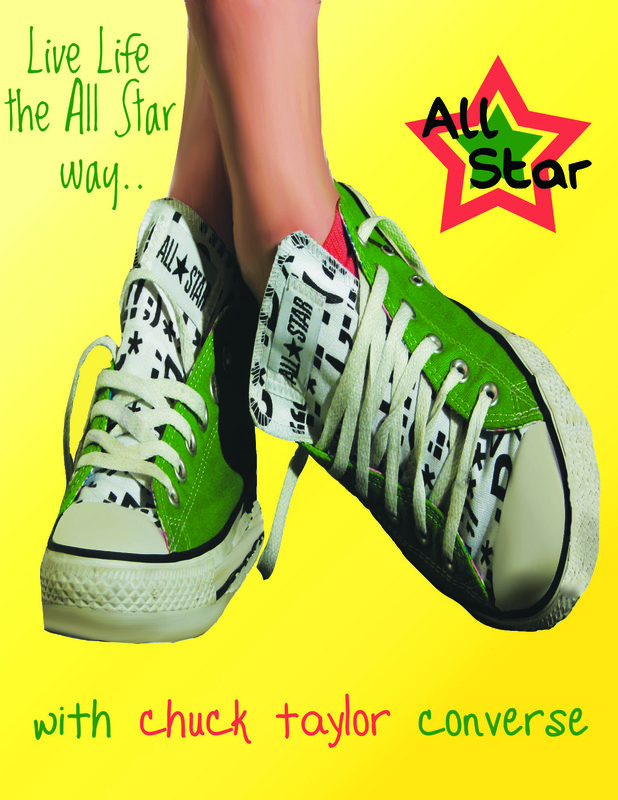 I was then able to make the stars the same colors as the font and the shoes. The continuity helps the overall look of the ad. 3. Clone Stamp: This tool was used to complete one of the hardest parts of the project – the toe of the shoe. The toe of the shoe on the right had been cut off in the photograph and in an ad it doesn’t look right, so I made my own toe. I did this by using the clone stamp tool on the other parts of the toe to mimic the rest of it. I have to say I’m really excited that it worked out because it took forever. This project was my crash course in photoshop. I now feel comfortable doing almost anything in this program and I can’t wait to do more editing in the future! I would definitely buy these shoes after seeing this ad! The colors and the font go so well together. And the product is in perfect focus. Good job. The colors are gorgeous ! Nice use of the clone tool ! This is really cute and shows a more punchy side to converse shoes. I really like the color scheme and it’s really impressive that you recreated the tip of the shoe. Great job! This is an effective ad all around because of the playful tone that it gives off. Both the gradient in the background and the redesigned logo enhance the fun-spirited attitude that embodies Chuck Taylors. I’ll just be a little repetitive and say that I’m really glad you didn’t do a rainbow background. It keeps the tongues in my immediate eyeline. I like how the colors remain constant in this ad and make it colorful but not jumbled. I would’ve like to see you use the shapes included on the tongue on the shoe more in the picture. I like everything about this ad. I could definitely see this in a magazine. Great colors. You have a very clear selling point and this ad is simple, but very effective. Nice job perfecting the legs! Great work on adding more shoe. I think it looks nearly flawless. The color scheme is cool too. I think you did a great job using the magnetic wand to cut the shoes out of the original picture. That took a lot of effort and precision. My one suggestion is to put a period at the end of your slogan to make it a sentence. Other than that, great job! I love how you used the colors of the shoe and socks! You did a great making sure every detail carried over from the picture to the ad. You also did a great job fixing the toe and the side of the shoe. This is a great ad because of all of the colors, they really make the shoes stand out. I just think that the shoes look a little squished but still a great shot! You did a really good job cutting out with the lasso cutting out the shoes…they look great! I also really like this color scheme and the fact that you matched the sock with the one star outline in your logo. Great job! I really loved this ad because of the bright colors that you used. It reminds me of summer and all the things I love about it! I couldn’t even tell that you had to reconstruct parts of the shoe, so great job!